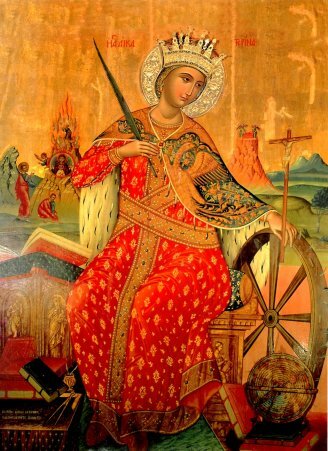 The legend of St. Catherine of Alexandria is unsupported by solid historical authority. Devotion to her began in the West about the Eleventh Century and was widely spread by the Crusaders. We have still much to learn about the personality of St. Catherine, but although the particulars of her life are uncertain, God has been pleased to glorify his saint on Mount Sinai, where her tomb is still venerated by pilgrims. St. Gertrude, who from childhood had had a great devotion to St. Catherine, once asked of Our Lord to be allowed to see the heavenly glory of her patron. Her prayer was heard, and she beheld the virgin of Alexandria on a golden throne surrounded by the sages whom she had led to a knowledge of the faith, and who formed her brightest crown in Heaven. A virgin and martyr whose feast is celebrated in the Latin Church and in the various Oriental churches on November 25, and who for almost six centuries was the object of a very popular devotion. Of noble birth and learned in the sciences, when only eighteen years old, Catherine presented herself to the Emperor Maximinus who was violently persecuting the Christians, upbraided him for his cruelty and endeavoured to prove how iniquitous was the worship of false gods. Astounded at the young girl’s audacity, but incompetent to vie with her in point of learning the tyrant detained her in his palace and summoned numerous scholars whom he commanded to use all their skill in specious reasoning that thereby Catherine might be led to apostatize. But she emerged from the debate victorious. Several of her adversaries, conquered by her eloquence, declared themselves Christians and were at once put to death. Furious at being baffled, Maximinus had Catherine scourged and then imprisoned. Meanwhile the empress, eager to see so extraordinary a young woman, went with Porphyry, the head of the troops, to visit her in her dungeon, when they in turn yielded to Catherine’s exhortations, believed, were baptized, and immediately won the martyr’s crown. Soon afterwards the saint, who far from forsaking her Faith, effected so many conversions, was condemned to die on the wheel, but, at her touch, this instrument of torture was miraculously destroyed. The emperor, enraged beyond control, then had her beheaded and angels carried her body to Mount Sinai where later a church and monastery were built in her honor. So far the Acts of St. Catherine. Unfortunately we have not these acts in their original form, but transformed and distorted by fantastic and diffuse descriptions which are entirely due to the imagination of the narrators who cared less to state authentic facts than to charm their readers by recitals of the marvellous. The importance attached throughout the Middle Ages to the legend of this martyr accounts for the eagerness and care with which in modern times the ancient Greek, Latin and Arabic texts containing it have been perused and studied, and concerning which critics have long since expressed their opinion, one which, in all likelihood, they will never have to retract. Several centuries ago when devotion to the saints was stimulated by the reading of extraordinary hagiographical narrations, the historical value of which no one was qualified to question, St. Catherine was invested by Catholic peoples with a halo of charming poetry and miraculous power. Ranked with St. Margaret and St. Barbara as one of the fourteen most helpful saints in Heaven, she was unceasingly praised by preachers and sung by poets. It is a well-known fact that Bossuet dedicated to her one of his most beautiful panegyrics and that Adam of Saint-Victor wrote a magnificent poem in her honor: “Vox Sonora nostri chori”, etc. In many places her feast was celebrated with the utmost solemnity, servile work being suppressed and the devotions being attended by great numbers of people. In several dioceses of France it was observed as a Holy Day of obligation up to the beginning of the seventeenth century, the splendour of its ceremonial eclipsing that of the feasts of some of the Apostles. Numberless chapels were placed under her patronage and her statue was found in nearly all churches, representing her according to medieval iconography with a wheel, her instrument of torture. Whilst, owing to several circumstances in his life, St. Nicholas of Myra, was considered the patron of young bachelors and students, St. Catherine became the patroness of young maidens and female students. Looked upon as the holiest and most illustrious of the virgins of Christ, it was but natural that she, of all others, should be worthy to watch over the virgins of the cloister and the young women of the world. The spiked wheel having become emblematic of the saint, wheelwrights and mechanics placed themselves under her patronage. Finally, as according to tradition, she not only remained a virgin by governing her passions and conquered her executioners by wearying their patience, but triumphed in science by closing the mouths of sophists, her intercession was implored by theologians, apologists, pulpit orators, and philosophers. Before studying, writing, or preaching, they besought her to illumine their minds, guide their pens, and impart eloquence to their words. This devotion to St. Catherine which assumed such vast proportions in Europe after the Crusades, received additional eclat in France in the beginning of the fifteenth century, when it was rumoured that she had appeared to St. Joan of Arc and, together with St. Margaret, had been divinely appointed Joan’s adviser. An example will illustrate. Although all these texts mention the miraculous translations of the saint’s body to Mount Sinai, the itineraries of the ancient pilgrims who visited Sinai do not contain the slightest allusion to it. Even in the eighteenth century Dom Deforis, the Benedictine who prepared an edition of Bossuet’s works, declared the tradition followed by this orator in his panegyric on the saint, to be in a great measure false, and it was just at this time that the feast of St. Catherine disappeared from the Breviary of Paris. Since then devotion to the virgin of Alexandria has lost all its former popularity. O God, Who didst give the law to Moses on the summit of Mt. Sinai and by means of Thy holy angels didst miraculously place there the body of blessed Catherine, Thy virgin and martyr, grant we beseech Thee, that, by her merits and intercession, we may be able to come unto the mountain which is Christ.Who with Thee livest and reignest, in the unity of the Holy Ghost, God, Forever and ever. R.Amen. O Lord, we beseech You, arouse the wills of Your faithful people that, by a more earnest search for the fruit of Your divine work, they may receive more abundantly of the healing effects of Your goodness. Through Jesus Christ, thy Son our Lord, Who liveth and reigneth with thee, in the unity of the Holy Ghost, ever one God, world without end. Graciously receive, O Lord, the gifts which we offer on the solemnity of Thy virgin and martyr, Catharine by whose patronage we trust to be delivered from all evil. Jesus Christ Thy Son our Lord, Who liveth and reigneth with Thee in the unity of the Holy Ghost, one God Forever and ever. R.Amen. Be merciful, O Lord, to our humble requests and accept the offerings and prayers of Your people: turn the hearts of all of us to You, that, freed from earthly cravings, we may pass over to heavenly yearnings. Through our Lord Jesus Christ Thy Son our Lord, Who liveth and reigneth with Thee in the unity of the Holy Ghost, one God Forever and ever. The Liturgical cycle ends with this last week of the ecclesiastical year, and with it the history of the world which it has recalled to our minds throughout its course from Advent to this Last Sunday after Pentecost. The Assyrians have destroyed Samaria, and the Chaldeans have laid waste Jerusalem; but all this desolation will be repaired by the Messias, when He comes. And Micheas goes on to foretell that Christ will be born at Bethlehem, and that His Kingdom, that of the heavenly Jerusalem, will have no end. The prophets Nahum, Habacuc, Sophonias, Aggeus, Zacharias and Malachias, whose books are read in the divine office in the course of this same week, add their testimony to that of Micheas. In our Lord’s first words in today’s Gospel he quotes Daniel’s prophecy of the total and final ruin of the Temple at Jerusalem and of the Jewish nation at the hands of the Roman army, this “abomination of desolation” being the punishment incurred by the people of Israel for having crowned their long career of infidelity by the rejection of Christ. As a matter of fact this prediction was fulfilled some years after our Lord’s death, amidst such circumstances of distress, that if it had lasted long, not a single Jew would have escaped alive. It was God’s will, however, that the siege of Jerusalem should be shortened for the sake of those who were converted as a result of so severe a lesson. It will be the same at the end of the world of which the destruction of this city is a type. For “then”, at our Lord’s coming, there will be tribulation of a still more agonizing kind. “But in this case also,” St. Jerome continues: “God will shorten those days; lest even the elect, if that were possible, be deceived” (Ibid.). For the rest, our Lord warns us to make no mistake as to the coming of the Son of Man in glory, without limitation of space or time and with the rapidity of lightning, in contrast to His first coming, veiled in sacred mystery and in one little corner of the world. Then all the elect will go to meet Him as eagles flock to their prey. His coming will be heralded by all kinds of catastrophes on earth and in the sky while all the tribes of the earth shall mourn; “and they shall see the Son of Man coming in the clouds of Heaven with much power and majesty” (Gospel). “When”, says St. Basil, “the inclination to sin comes upon you, I wish you would think of this dread and awful tribunal of Christ, where He will sit and judge on His throne on high. There every creature will appear, and stand trembling in His presence, and there shall we be led, one by one, to give an account of the actions of our life. And immediately afterwards those who in life have wrought much evil will be surrounded by fearful and hideous angels, who will throw them headlong into a bottomless pit where in impenetrable darkness burns a fire which gives no light; where worms whose bite is intolerable anguish, ceaselessly gnaw the flesh; and where, sharpest of all punishments, shame and confusion reign without end. Fear these things and pierced by this dread, use it as a bridle to help your soul from being drawn away by concupiscence into sin” (Third nocturn). Further, in the Epistle, the Church exhorts us, in the apostle’s words to “walk worthy of God” and to be fruitful in every good work”, so that strengthened with all might according to the power of His Glory “we may endure all things in patience and joy”, giving thanks to God the Father, who hath made us worthy to be partakers of the lot of the saints in light, both now in spirit and at the last day both in body and soul through the redeeming blood of “the Son of His love”. Amid all the tribulation at the end of the world and of the last Judgment and in the agony of our own death, our souls will cry from the depth to our Lord that we “may receive more abundant helps from His mercy” (Collect). And God, who has told us through His servant Jeremias, that He thinks thoughts of peace and not of affliction (Introit) and who has promised to hear the prayer of faith (Communion) will hear us by delivering us from earthly desires (Secret) by “turning away our captivity” (Introit), and by opening to us that eternal heaven where the glorious consummation of Christ’s triumph will be reached. Wholly victorious over His enemies, who will rise from the dead to receive their punishment, and undoubted king of all the elect, who have believed in His coming and will rise to eternal glory of both body and soul, Christ will restore to His Father that kingdom which He has conquered at the cost of His Own blood, as an act of perfect homage from Head and members alike. This will be the true pasch, the full passing into the real land of promise, and the taking eternal possession by Christ and His people of the heavenly Jerusalem where, in the temple not made with hands, God reigns as acknowledged sovereign “in whom we will glory all the day; and in whose name we will give praise forever” (Gradual).